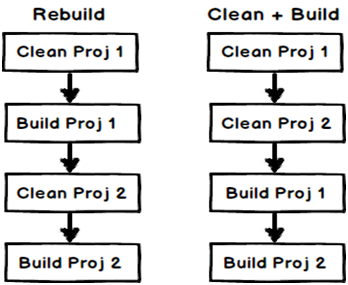 Following is C#.NET interview questions on comparison of Build Vs Rebuild Vs Clean solution. 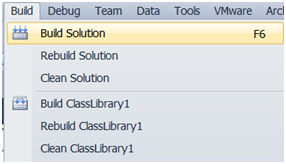 Build solution menu: - This will perform an incremental build. In other words it will only build code files which have changed. If they have not changed those files will not touched. Rebuild solution menu: - This will delete all current compiled files (i.e. exe and dll’s) and will build everything from scratch, irrespective if there is code change in the file or not. Clean solution menu: - This menu will delete all compiled files (i.e. EXE’s and DLL’s) from “bin” / “obj” directory. The difference is the way the build and clean sequence happens for every project. Let’s say if your solution has two projects “proj1” and “proj2”. 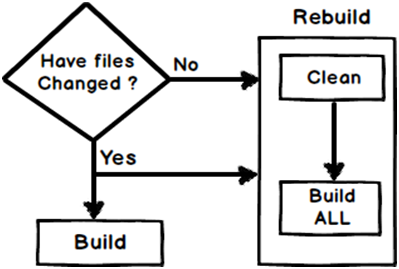 If you do a rebuild it will take “proj1”, clean ( delete) the compiled files for “proj1” and build it. After that it will take the second project “proj2”, clean compiled files for “proj2” and compile “proj2”. But if you do a “clean” and build”. It will first delete all compiled files for “proj1” and “proj2” and then it will build “proj1” first followed by “proj2”. Below image explains the same in a more visual format.